The big day is finally here! Today is Promo Day! 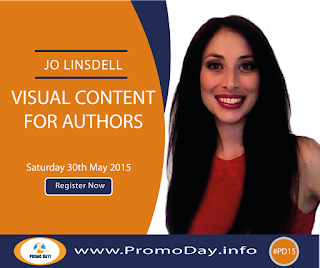 I'll be over at www.PromoDay.info all day today, and also busy on social media with the hashtag #PD15. I hope you'll all come and join me for my webinar Visual Content for Authors during today's event, and connect both via the event forums and via social media. I'm really proud of where Promo Day is now and the success it continues to have each year. I personally get a lot out of the event and know from feedback that others do too which makes it doubly gratifying. Registration will remain open all day so you still have time to register and be part of the fun. Just go to www.PromoDay.info and click on the "Register Now" tab in the navigation bar at the top of the screen.